X-ray astronomy satellite "SUZAKU" (ASTRO-EII) was launched by the M-V 6 rocket on 10 July, 2005.
Business Development, International, AIAA "One might say that I was destined in some way to be working in aerospace at this point in my career. And to be honest, it does not surprise me that my life journey has led me to AIAA." 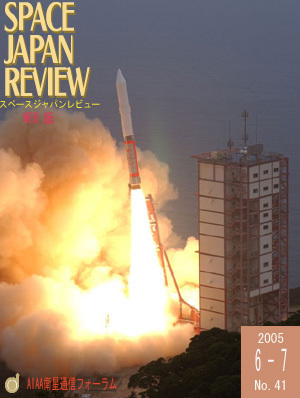 Mr Angelo Iasiello talks for the Space Japan Review. (1)Their Majesties the Emperor and Empress visited a space communication related facility. "Their Majesties the Emperor and Empress visited NICT Kashima Space Communications Center after attending the national planting festival held at Suigou Prefectural Forest in Itako City."